The April/May issue of Tourist Attractions and Parks Magazine contains a wide range of articles, including an extensive section covering the F2FEC and Amusement Expo shows, a special focus on food service, and coverage of how waterparks and amusement parks handle the buildup to a new season in improvements and maintenance. The Buzz Boyz topic for this issue was “Perspectives on Industry Optimism – A Look at Amusement Expo, Dallas, Texas, Foundations and F2FEC,” from industry experts Scott Borowsky and Frank Seninsky. The Entertainment Center Report features articles such as “Ideas for Great Events – Party Advice for Bowling Centers” and an accompanying Bonus Sidebar on “Tips to Celebrate the Star of the Show.” In “An Old Favorite Gets a New Twist: The Honolulu Hotdog” is the topic, while “Maintenance Routines to Keep Courses Up to Par – Tips for the Best Practices at Mini-Golf Facilities” covers ways to keep courses well maintained. “Escaping from Dirt and Grime – Keeping Escape Rooms Clean and Bright” covers cleaning at escape attractions when time between guests is brief. “Perspectives on a Vendor: Swipe Cards for Solid Performance” covers the Sacoa Swipe Card System. The Entertainment Report Roller Skating Extra included topics such as “Getting Guests Hungry for More – How Food Can Create Satisfied and Skating Customers” and improve profits at roller skating centers. 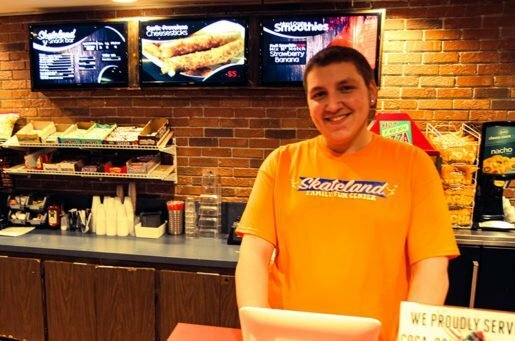 A bonus sidebar discusses “Top Tips to Sell More Food at Roller Skating Rinks.” The article “Pies for Sky-High Sales – Making the Best Pizza” describes the process of pizza purveying. The Laser Tag section includes “When the Focus Is Fun – The Best Arcade Games for Laser Tag Centers.” Also presented: “The 2017 Laser Tag Convention Organizers Report an Industry Hit.” The convention drew global buyers for a successful trade show. In “Scenes, Springs and Sustenance – Where the Movies Mix with Trampolines and Treats,” the idea of movie theaters and trampoline parks as a winning combo – plus food – is discussed. In Amusement Rental/Inflatable News a discussion on keeping “Sales on the Up and Up – Training Your Staff to Upsell When Booking Events” is offered, discussing how party companies keep customers informed about all their offerings. Andretti Indoor Karting and Games is profiled in the April/May edition of TAP. 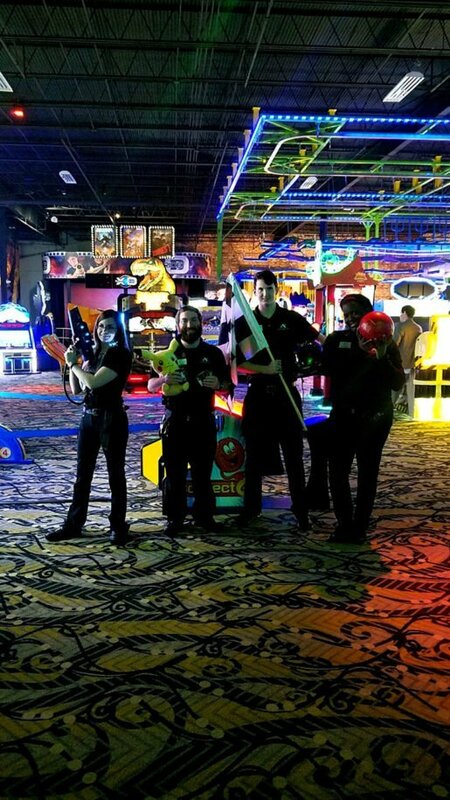 Shown are Andretti’s: Christina Parker, arcade/attractions tech; Zachary Baab, arcade tech; Timothy Dobbs, arcade attendant; and Afrika Jackson, starting line/bowling attendant. Skateland Family Fun Center’s Rink Ranger Michael Brookes. The Westland, Mich., center is included in a story about selling the best pizza in the April/May issue of TAP. 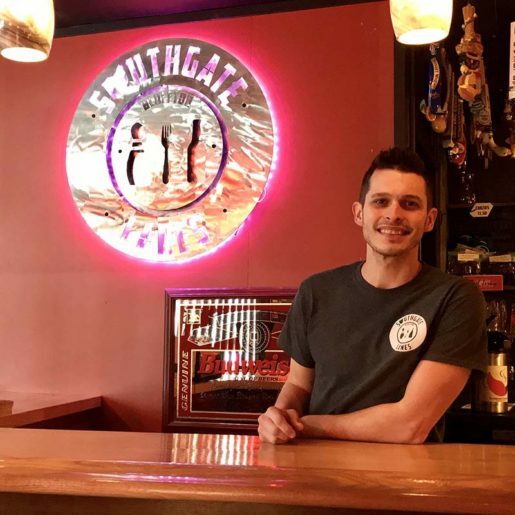 Derek Dukes, general manager of Southgate Lanes in Bluffton, Ohio. An interview with Dukes about bowling center parties appears in the April/May 2017 edition of TAP. Bowling centers and skating rinks both share a number of attributes: large crowds of customers, snack bars, and plenty of fun for families, teens, and couples. But they also have something else in common: the constant drive to keep their facilities neat and clean. Here’s how they do it. Lori Kottwitz, owner of The Bozeman Bowl in Bozeman, Mont., says the best way to keep a spotless center is have a cleaning company in daily along with well-trained staff. “We have a company come in at 3 a.m. every day, and then our lanes are mopped every morning by our own staff. The cleaning company takes care of restrooms as well. We also keep a to-do list for staff. That way they know they have to do certain things like wiping down tables and chairs, and making sure the balls are put away, the shoes are put away, and things like that. It’s really kind of a combination of a good outside cleaning service and having our staff follow a checklist,” she asserts. Jacques finds his counter the most challenging part of keeping his center neat and orderly. “We use the area behind it to store birthday cakes for parties, so it can be difficult. We do a hand-stamp system so kids are also always putting their hands down on the counter. We have a lot of glass around, so keeping that cleaned regularly, and keeping the counter space free of advertising and other clutter is key,” he reports. 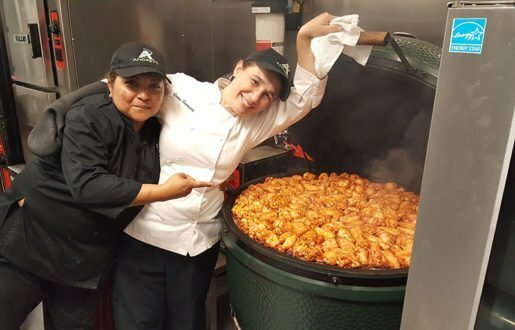 Andretti Corporate Executive Chef Anna Firmani, at right, photographed with a staff member in a kitchen. The April/May 2017 issue of TAP includes an in-depth look at the company. 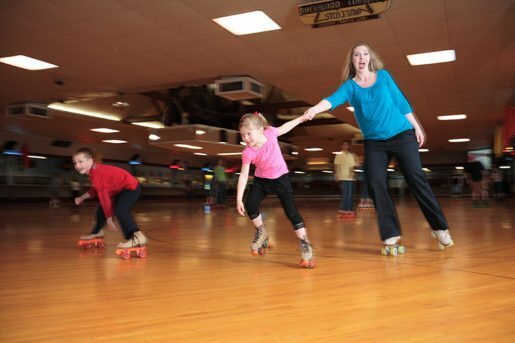 Oaks Park Association Promotion and Events Manager Emily MacKay skates with her daughter. The center is featured in the April/May issue of TAP. How do bowling centers and skating rinks keep their signage from looking dated? Staff members share their tips. At Les & Jim’s Lincoln Lanes in Merrill, Wis., Owner Jim Arndt has a system in place to prevent outdated signage. “On Monday mornings someone goes through the center, and looks at posters and signs. If there is anything that’s outdated they tear them down. Additionally, if someone brings in a poster they need to have hung, the manager on duty puts it on my desk to approve. We have one specific area of the building where we allow posters to be put up, and they all need my approval. It makes it easier when they are in one area and not scattered outside the building. Our in-house promos we do have throughout the building, but it’s on our checklist to go through and tear down any outdated posters. 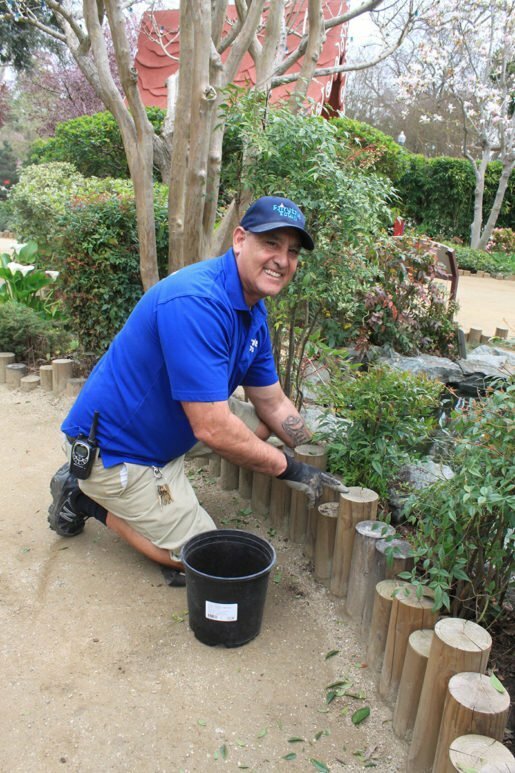 Fairytale Town Grounds Manager George Ortiz at work in this storybook park . A look at how the attraction keeps its facility looking great appears in an article in the April/May issue of TAP. 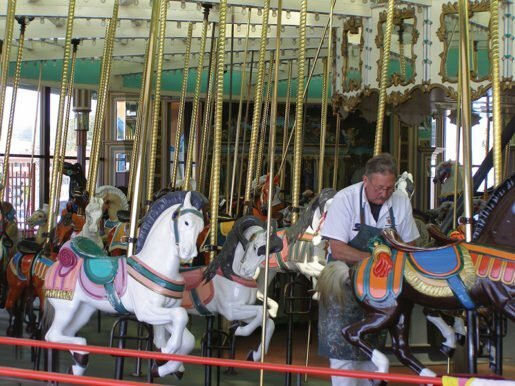 Jimmy Raun-Byberg touches up the Santa Cruz Beach Boardwalk’s Looff Carousel every winter. Maintenance tips from the location appear in the April/May 2017 issue of TAP. American Wave Machines, Inc., recently announced that the Sawgrass Marriott Golf Resort and Spa, adjacent to TPC® Sawgrass, one of the PGA Tour’s most venerable courses, is the first resort in the United States to include the SurfStream® wave machine. The newly renovated resort featured former ASP World Tour Surfers Lauren and Todd Holland, owners of School of Surf – Cocoa Beach, Fla., providing surfing demonstrations and instruction on SurfStream® during opening weekend. SurfStream® technology creates a deep cushion of water so riders can use real surfboards with fins to carve on an endless wave. With multiple wave types in one machine allowing for body boarding and surfing, SurfStream® is appropriate for riders of all skill levels.